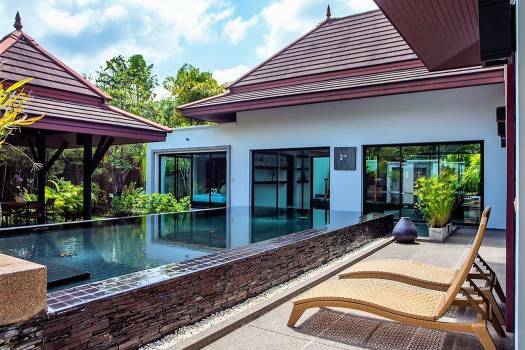 Private Pool Villa Sea View Kamala Beach, 4 bedrooms, 4 bathrooms, western kitchen, fully furnished, living and dining room, terrace. The villa is over 300 sq meters interior and over 400 square meters built-up. There are two king beds, one queen bed, and two twin beds. There is an additional sofa bed in one bedroom and child’s bed in another bedroom. All bedrooms have en suite bathrooms. Two of those bathrooms also have bathtubs. There is a half bath next to the living room that is accessed from the deck near the pool. The dining table has seating for ten. There are two cheap chairs in storage that can be added. There are no interior hallways and all rooms have outside entrances. Every room has individual air conditioning and fans. Most of the air conditioning is built-in. The living room has floor to ceiling glass doors that open it up to the pool deck. BBQ grill that can be brought up to the deck if the guests want it. All rooms have WiFi internet.